Once in a while, things fall nicely into place. Last night our plans included taking in the new production of “Doubt”, being staged by the Tangent Theater Company in Tivoli. It is a play we had missed at Vassar’s Powerhouse Theater and regretted ever since. 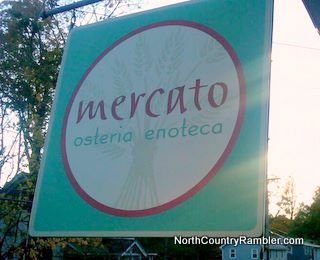 For some time we have also been looking for an opportunity to have dinner at Mercato in Red Hook, a genuine osteria (family run roadhouse) which has been up at the top of the local foodie buzz charts since they opened three years ago. I love when a plan comes together. We were hoping to have dinner at 6 PM, leaving us enough time to make the eight o’clock curtain. I also like to stop and have a glass of wine at the bar before dinner, and scope out the menu and the space. A peek at the restaurant’s website confirmed the “Enoteca” was in fact a wine bar, and it turned out to be the classic bistro bar, complete with white marble bar top, and a fabulous selection of Italian wines. We should not have been surprised by the scope and quality of the selections, as one of the proprietors, Francesco Buitoni, honed his considerable skills with Tony May and Mario Batali in New York, including a stint as sommelier at Batali’s Otto. The list offered over fifty selections representing the many regions and grape varieties of Francesco’s native Italy. Mr. Biutoni operates the restaurant with his wife and long time partner Michele Platt. After seeing the bar and the wine list, they had us right there; the food could have been passable and I would have been happy. We started with a glass of Bastioni Gavi di Gavi ($9) settled in on the corner stools, and refused to leave. We asked to cancel our reserved table and have our dinner right there with our new favorite bartender, Allie. We were not to be disappointed. I suppose the restaurant was happy to have the table, as the cozy space only seats thirty six, not including a very small separate room in the back. The main dining room is separated from the kitchen by a large exposed archway, which puts the kitchen on stage front and center, as it should be. When we left every seat was full. We started with a special offering of octopus salad ($15) served with a frisee salad tossed with celery and capers. The octopus, one of my favorite dishes, was perfectly prepared. A very generous portion was first braised, then grilled briefly, then tossed with a good olive oil. The result was sweet, tender, and absolutely delicious. The accompanying frisee was also remarkable. As simple as it sounds – the sweetness of the celery, the briny capers, and the frisee with a touch of lemon and olive oil – all added up to more than the whole. Octopus, or any cephalopod, is hard enough to cook without ending up with rubber bands. This presentation was right up there with the best I have ever had. And we were just getting started. And in need of more wine. Knowing at this point that we were in for a fabulous meal, we selected a bottle of 2004 La Columbina Brunello Di Montalcino for $68. The wine retails for around $45, so the mark up was most reasonable. It was a wonderful companion for the rest of the meal, even if it personally might have appreciated staying corked for another year or two. Another special showcased the kitchen’s efforts to use locally sourced seasonal products. A kale salad, tossed with a lemon vinaigrette sounds simple enough, but kale can often be bitter and tough unless it is sauteed, the only way I have ever served it. (Sauteed Tuscan kale was also available as a side dish on the menu for $6.) In this dish the raw kale was simply cut into very thin strips, tossed with dried currants and a sweet lemon dressing, and topped with pecorino. It was hard to believe that it was kale. I asked Allie, our server, if it had been processed somehow first. She said, and I quote, “No, the chiffonade cut allows the citric acid from the lemon dressing to penetrate and tenderize the kale. That’s all there is to it.” ‘Nuf said. A kitchen that knows how to do it and a bartender who knows what chiffonade means. We were at this point, quite impressed. One of the evening’s blackboard specials offered a bowl of home made farro pasta, tossed with butternut squash, fresh shitaki mushrooms, wild gulf shrimp, and arugula. Farro is not actually a wheat, but is lately used in many Italian dishes as an alternative to it. The texture is more substantial than wheat pasta. It has the color of, and tastes reminiscent of brown rice. The starch blends – risotto like – with the accompaniments, and this dish was a wonderful example. I tried the branzino – a Mediterranean sea bass which was also offered as a special for $24. Perfectly prepared, the fish was fileted and served skin on. The flesh was moist, flaky, and tender and scrumptious. Another special, and one that I hope to see on future visits, is spaghetti tossed with Maine sea urchin and jonah crab ($20). Not your average dinner special, and it sounds like a fascinating combination of flavors. Additional traditional bistro specials included a hanger steak ($23), or braised local lamb shanks served with local vegetables. Two more good reasons to try another Brunello! We put the remnants of the wine to good use with a desert platter of cheeses, which was way too much for just the two of us. The offering included a pecorino, an Italian Augustino, and the requisite local Coach chevre. Adorning the plate were two halved fresh figs, which solidified the restaurant as one of our new favorites. I love fresh figs. In past posts I have suggested that successful restaurants have some magic combination of people, space, menu, and market. Add a lot of hard work and in this case good genes (Francesco Biutoni is one of the Biutoni’s) and you have the potential for a truly great restaurant. Which is what we have here at Mercato. Add it to your list. Buon Appetito!